Service management metrics (at times also referred to as 'key performance indicators' or 'KPIs') are used to assess if the processes are running according to expectations. Defining KPIs is above all about deciding what exactly is considered "successful" process execution. Once this is established, suitable quantitative and qualitative metrics for the service management processes (the service lifecycle processes and the supporting processes) can be defined and subsequently measured. The process owners are then in a position to evaluate the quality of their processes, which in turn is the basis for process improvement. The exact definitions of the metrics will vary depending on the nature of the service provider organization, so the key performance indicators contained in this wiki can only be suggestions. Generally speaking, there is no shortage of recommendations for service management metrics. If further ideas are needed, the various service management frameworks like ITIL® , COBIT®  and USMBOK™  may be consulted - but we advise using a focused set of metrics or KPIs that can be managed and acted upon in the long term. As the name suggests, quantitative metrics are typically straightforward measurements of volumes and frequencies (e.g. the number of service requests reported to 1st level support). Such metrics may not say much about the quality of the service request fulfillment process, but they can be useful for managing the resources required to fulfill service requests. Qualitative metrics have a more direct relationship to successful process execution. For example, if a service provider aims to resolve a high percentage of incidents directly in 1st level support, the 1st-line resolution rate would be a suitable qualitative metric. How to measure the performance of the service lifecycle processes in the YaSM service management model? The following tables provide you with suggestions for quantitative and qualitative process metrics. Process metrics: "Set the strategic direction"
Number of strategic reviews performed during the reporting period. Number of strategic objectives defined following strategic reviews. Number of strategic initiatives launched during the reporting period. Percentage of strategic objectives which are being actively pursued with defined strategic initiatives. Number of strategic initiatives which were successfully completed during the reporting period. Number of new or significantly changed services which were introduced following a strategic review. Number of service improvements implemented due to insights gained during strategic reviews. Number of services which were retired due to insights gained during a strategic review. Number of process improvements implemented due to insights gained during strategic reviews. Process metrics: "Design new or changed services"
Number of new or significantly changed services designed during the reporting period. Number of implementation blueprints produced for new or significantly changed services. Number of requirements specifications produced for infrastructure items or other service components which were needed to provide new or significantly changed services. Percentage of new or significantly changed services which were introduced using the documented service design process vs. new services introduced without using that process. Number of other services which were unexpectedly found to be impacted by the introduction of new or significantly changed services, due to errors made during the service design phase. Percentage of new or significantly changed services that failed to deliver the expected outcomes due to errors made during the service design phase. Process metrics: "Build new or changed services"
Number of new or significantly changed services implemented during the reporting period. Percentage of new or significantly changed services which were introduced using the documented service build process vs. new services introduced without using that process. Duration of service implementation projects from autho-rization of the service development project to confirmation of service readiness. Percentage of software components deployed by means of automated distribution. Percentage of service components which failed to pass acceptance tests. Number of incidents attributable to newly deployed service components, grouped by services and service components. Percentage of new or significantly changed services which failed to deliver the expected outcomes due to errors made during the service build phase. 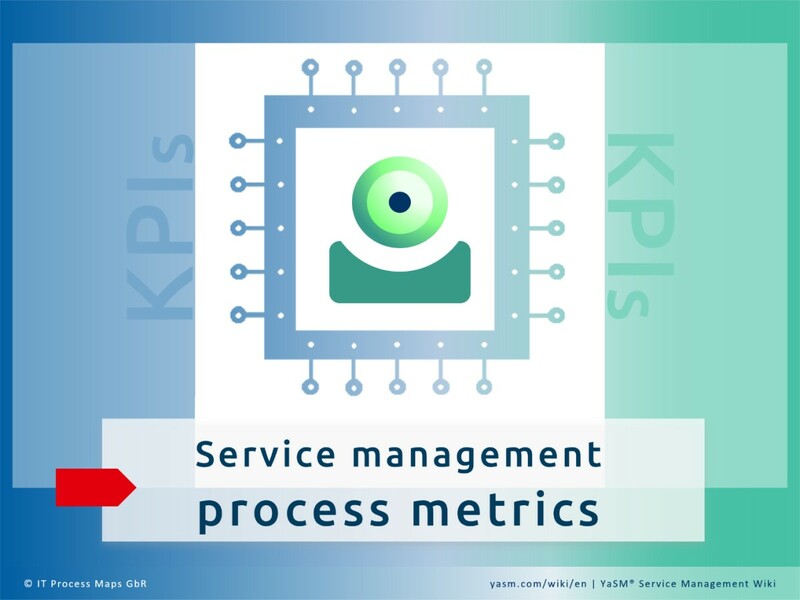 Process metrics: "Operate the services"
Number of services which are constantly monitored in order to pro-actively avoid service interruptions or deficiencies in service quality. Number of services whose quality levels are regularly measured and reported, as a basis for improving the services. Number of events generated by event monitoring systems, grouped by categories (e.g. events related to particular systems, events requiring human interaction, events triggering an automated response, ...). Percentage of services which are constantly monitored. Number of events where an automated response is triggered vs. the total number of events requiring a response. Percentage of services whose quality levels are regularly measured and reported. Number of service incidents which could have been avoided by more adequate preventive maintenance. Number of issues detected during service quality reporting which result in a service improvement initiative being started. Process metrics: "Resolve incidents and service requests"
Number of incidents resolved by invoking the special procedure for major incidents. Percentage of incidents where a hierarchic escalation occurred. Number of workarounds provided to incident management. Percentage of problems raised as part of the pro-active problem identification process. Number of reported incidents linked to the same problem after a problem has been identified. Average time between problem registration and identification of the underlying cause. Process metrics: "Improve the services"
Number of formal service reviews carried out during the reporting period. Number of weaknesses to be addressed by improvement initiatives which were identified during service reviews, possibly grouped by services. Number of defined improvement initiatives, resulting from identified weaknesses during service reviews, possibly grouped by services. Number of service improvement initiatives which were completed successfully during the reporting period, possibly grouped by services. How to measure the performance of the supporting processes in the YaSM service management model? The following tables provide you with suggestions for quantitative and qualitative process metrics. Process metrics: "Set up and maintain the service management system"
Number or service management processes which are documented in the process model. Number of formal process reviews and audits carried out during the reporting period. Percentage of service management processes which are assigned to a process owner. Percentage of service management processes where process metrics are defined, measured and acted upon. Percentage of service management processes which are subjected to regular process reviews or audits according to the process review plan. Number of weaknesses to be addressed by improvement initiatives which were identified during process reviews or audits, possibly grouped by processes. Number of defined improvement initiatives, resulting from identified weaknesses during process reviews or audits, possibly grouped by processes. Number of process improvement initiatives which were completed successfully during the reporting period, possibly grouped by processes. Number of changes to the service management policies resulting from process reviews or audits, possibly grouped by policies. Process metrics: "Maintain the service portfolio"
Number of services managed through the service portfolio, grouped by customer and (internally or externally supplied) supporting services. Number of services added to the service portfolio during the reporting period. Number of services in the service portfolio where new versions have been introduced. Number of services that were retired. Percentage of services offered by the service provider which are documented in the service portfolio. Percentage of services in the service portfolio which are defined by authorized service definitions. Percentage of services in the service portfolio which are covered by agreements (i.e. customer services covered by customer service agreements and supporting services covered by operational or external service agreements). Number of inconsistencies between service definitions detected during service portfolio reviews (especially inconsistencies between customer services and supporting services). Process metrics: "Manage customer relationships"
Number of formal customer meetings held during the reporting period. Number of formal customer satisfaction surveys carried out during the reporting period. Number of received customer complaints during the reporting period. Average measured customer satisfaction for each service, determined by means of customer satisfaction surveys. Number of received customer complaints which were accepted (deemed justified and acted upon). Number of new or significantly changed services introduced due to insights gained during customer meetings or satisfaction surveys. Number of service improvements implemented due to insights gained during customer meetings or satisfaction surveys. Number of newly won customers during the reporting period. Number of customers which were lost to competing service providers. Process metrics: "Manage configuration information"
Number of configuration item types managed through the configuration management system (CMS). Number of configuration items managed through the configuration management system (CMS), possibly grouped by CI types. Number of recorded changes to configuration items, possibly grouped by CI types. Number of service incidents reported where the underlying cause of the incident was the result of inaccurate configuration information. Frequency of physical verifications of configuration information in the CMS. Percentage of configuration items in the CMS for which detection and verification can be done in an automated way. Average work effort for physical verifications of the CMS contents. Percentage of infrastructure components for which data is kept in the CMS. Number of unauthorized changes identified as a result of an audit. Number of errors found in the CMS as a result of an audit. Process metrics: "Assess and coordinate changes"
Number of major changes assessed by the change assessment process. Number of emergency RFCs assessed by the change assessment process. Number of defined pre-authorized standard changes, documented in change models. Average time from registering an RFC with the change manager until a decision on the RFC is reached (i.e. until it is either approved or rejected). Number of authorized vs. rejected RFCs. Percentage of changes implemented successfully. Number of changes that were implemented without authorization (identified, for example, during configuration audits). Number of unexpected service incidents caused by the implementation of authorized changes. Number of projects started, in progress and completed during the reporting period. Percentage of projects which were started with a signed project charter in place. Number of changes to the project scope after project start, per project. Actual vs. planned milestone and project completion dates, per project. Number of projects that have ended without achieving their stated goals. Number of risks managed through the register of security risk. Number of underpinning security policies maintained and published by the security manager. Percentage of identified security risks which are covered by suitable risk responses. Number of security improvements which were implemented in response to newly identified security threats. Average duration from the identification of a new security risk to the implementation of a suitable response. Number of security incidents causing service s to be unavailable. Number of identified issues during security tests to be addressed by security improvement initiatives. Process metrics: "Prepare for disaster events"
Number of (types of) disaster events for which prevention measures are deemed necessary and which are managed through the register of managed disaster events. Number of continuity plans maintained by the continuity manager. Percentage of identified and managed disaster events which are covered by suitable continuity plans. Number of continuity arrangements which were implemented in response to newly identified threats from disaster events. Average duration from the identification of a new threat from a disaster event to the implementation of a suitable response. Number of disaster events occurred during the reporting period. Number of disaster events occurred during the reporting period for which a suitable continuity plan was in place. Number of issues identified during continuity tests to be addressed by continuity improvement initiatives. Number of compliance requirements managed through the compliance register, possibly grouped by types of requirements (e.g. legal, ISO standard, internal policy, ...). Number of compliance requirements added to the compliance register during the reporting period due to new laws or regulations, possibly grouped by types of requirements. Number of compliance requirements removed from the compliance register during the reporting period, possibly grouped by types of requirements. Percentage of compliance requirements where conformity is ensured through suitable controls or mechanisms, including defined responsibilities for their implementation and operation. Percentage of compliance requirements which are covered by regular compliance reviews and audits. Number of compliance reviews and audits carried out. Number of non-compliance issues identified during compliance reviews and audits, which are to be addressed for example by modifications to processes or services. Number of non-compliance issues reported outside of formal compliance reviews and audits. Average time lag between identification and resolution of non-compliance issues. Process metrics: "Manage human resources"
Total number of staff employed by the service provider organization. Number of skills managed through the skills inventory. Number of employees who joined the service provider organization during the reporting period. Number of employees who left the service provider organization during the reporting period. Number of skills added to the skills inventory during the reporting period. Number of skills removed from the skills inventory during the reporting period. Percentage of skills in the skills register for which training and education is managed through a skills development plan. Number of external suppliers with "preferred supplier" status. Number of suppliers added to the supplier portfolio during the reporting period. Number of suppliers whose contracts were terminated during the reporting period. Percentage of externally supplied supporting services which are covered by external service agreements and corresponding service definitions. Share of goods and services procured from external suppliers with "preferred supplier" status, as a percentage of the value of all purchase orders. Percentage of supplier agreements which were reviewed for continued relevance during the reporting period. Number of formal supplier meetings held during the reporting period. Number of contract breaches, for example detected during supplier review meetings or service reviews. Process metrics: "Manage service financials"
Total budget of the service provider organization, possibly broken down into cost and revenue categories. Percentage of budget increase or decrease compared to the previous budgeting period, possibly broken down into cost and revenue categories. Deviation between predicted and actual spending and revenues, possibly grouped by cost and revenue categories. Percentage of overall costs which are allocated to the provision of particular services, possibly grouped by cost categories. Percentage of services where the customers are charged for service provision. Percentage of customer services where revenues exceed the cost for service provisioning. Percentage of investments approved during the reporting period where the budget request included an assessment of costs vs. benefits. Percentage of investments made during the reporting period where the predicted benefits were realized. USMBOK™ is a registered trade mark of Virtual Knowledge Solutions International Incorporated (VKSII).